WIPO and CambridgeIP research, focused on the most recent period with reliable patent data has found that in the period 2006 to 2011 patent filings in the focus areas of Biofuels, Solar Thermal, Solar PV and Wind Energy have been growing a combined annual rate of 24% â€“ far outstripping the global average annual growth rate of 6% in the period.Â Across the focus areas there were more patents filed in 5 years to 2011 than in the previous 30 years. Climate change is one of the most considerable global challenges of our time. In a WIPO Global Challenges study, the patent landscapes of four Climate Change Mitigation Technologies (CCMTs) were analysed to inform policy discussions by providing evidence of innovation trends, technology ownership and other facts from the global patent literature. 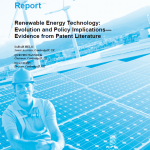 The resulting Global Challenges report, titled â€˜Renewable energy technology: Evolution and policy implications, evidence from patent literatureâ€™, focuses on the following CCMTs: Biofuels, Solar Thermal, Solar PV and Wind energy. Global patent activity in each of the focus CCMTs has been identified, analysed and benchmarked against global patent activity in all technologies. For each of the focus CCMTs case studies were developed, to help situate the patent data into the context of market activity. As Figure 1 illustrates, rates of patent filings in the focus Climate Change Mitigation Technologies (CCMTs) began to increase in the 1990â€™s. There has been a particularly striking increase in filing rates starting in 2006. The Global Challenges report published today additionally highlights increased patent activity from players in emerging economies across the focus areas, and provides evidence of multinational corporations deploying patented innovations in emerging economies.Â Around one third of patents considered used the patent cooperation treaty (PCT) system, which provides patent applicants intending to file in multiple countries around the world with a simplified route for doing so indicating growing international markets for the focus CCMTs. Quentin Tannock, Executive Chairman of CambridgeIP and an author of the report said â€œOur past work with Chatham House in 2009 charted the emergence of these technology areas and the patent landscapes surrounding them. The current report provides evidence of continued growth and innovation across the Biofuels, Solar Thermal, Solar PV and Wind Energy areas around the world and identifies differences in patent strategies, IPR concentrations and industry structures consistent with diverse and maturing technology-market spacesâ€. CambridgeIP is the global innovation and intellectual property consultancy. CambridgeIPÂ® and IP LandscapeÂ® are registered trademarks of Cambridge Intellectual Property Ltd, All Rights Reserved. For enquiries about CambridgeIPÂ and our work please contactÂ us.